I am rebuilding the wood cab of my TT. It currently has standard gearing but I am intrigued with the idea of installing an auxiliary transmission later. I am looking for pictures of the inside of cabs of TTs with auxiliary transmissions so I can see if I need to move my seat back to accommodate for the gear shifter. If you are thinking of using a Warford transmission, the old cast iron models were designed to push the shift lever forward to miss the seat. The new aluminum KC Layne transmissions do not have that feature, but bolt directly to the back of the transmission. So, you should be good either way unless your seat is closer to the dash than normal. I have no experience with other transmission, so I can't say about them. 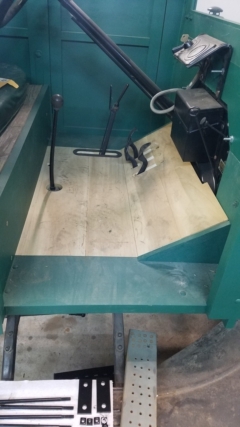 I have a 25' TT with a wood cab, that I am wrapping up putting a Warford into, the shifter does fit in front of the seat with just enough room, but I did have to cut a notch in the support that runs across the cab in front of the seat. A fun surprise to deal with was the crossmember to support the Warford crosses immediately in front of the fuel petcock, at some point in the past the petcock must have had some trouble with leaking, it did not want to turn and I did not want to disrupt it so I actually ended up drilling a hole for the fuel line trough the cross member. The auxiliary transmissions were designed to fit into these vehicles so unless you have a wood cab with the seat in a very forward position it should work out. 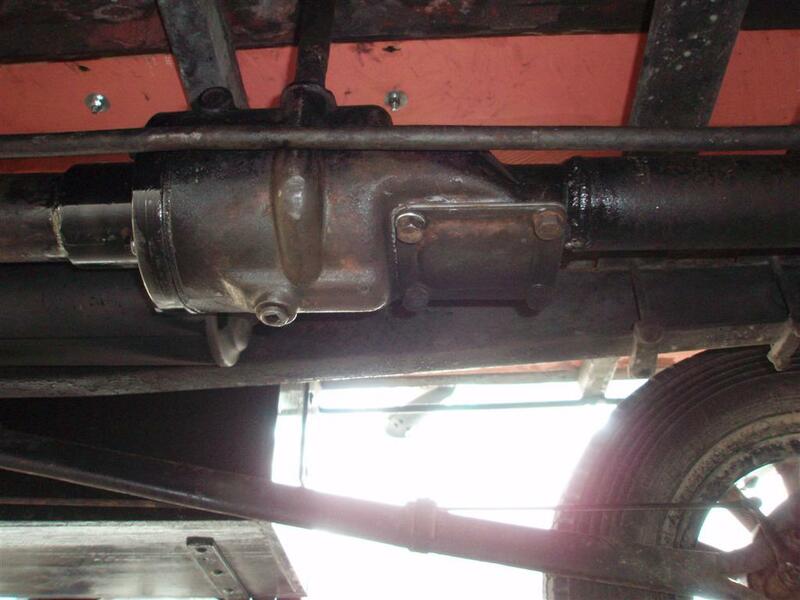 My solution was to use a Ruckstell underdrive unit from an AA truck. It was turned 180 and spliced into the drive shaft to give direct and an overdrive. It has a neutral, so shifting with care is needed! 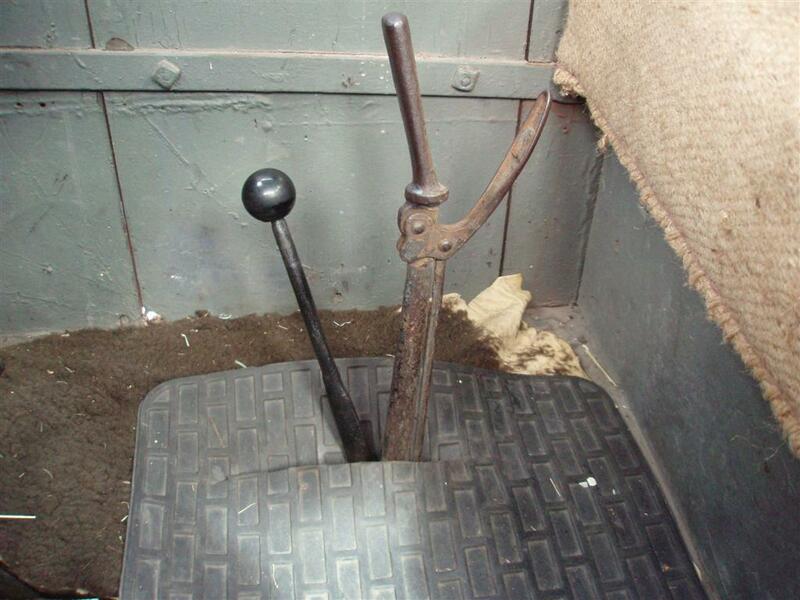 The shifter comes up in the slot for the hand brake, but has clearance for easy use (mine is a right hand drive truck). 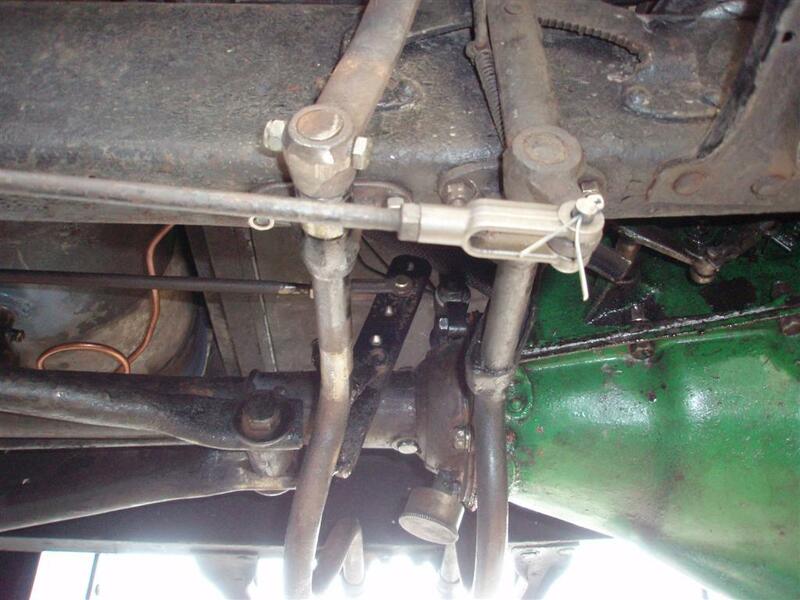 Shifter linkage was built from a second hand brake linkage modified to a rod that engages the Ruckstell change. The original AA shifter is a foot operated rocker on the cab floor, but using that required way more modification to the TT than the method we finally settled on. The original Warford kit included an offset fitting to move the sediment bulb out of the way. 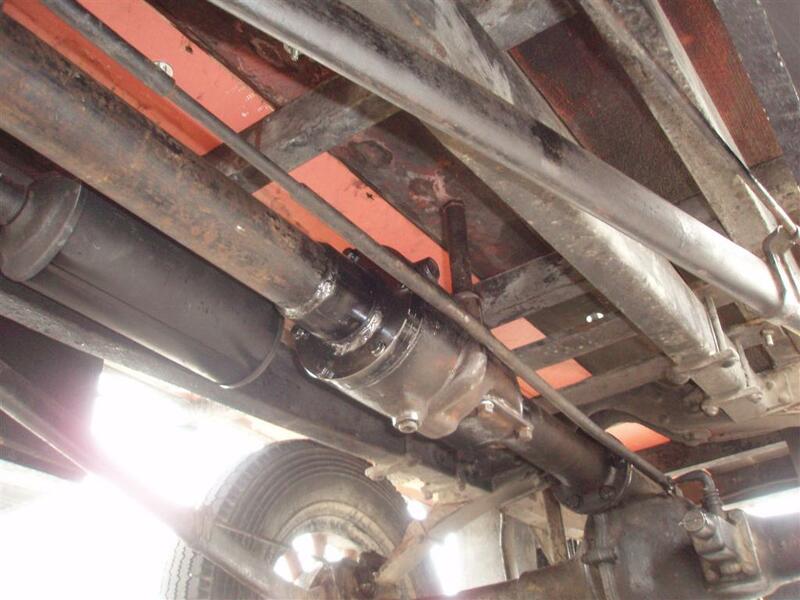 When I installed my home made support in the huckster I too cut a notch for the fuel line. Thanks guys, this is helpful information. Dallas, I am surprised at how small the hole is for the shifter. There must not be a lot of travel needed for the shifting rod to shift gears (but remember I am new to all this). Mark, I suspected there was some sort of relocation for the bulb, If mine moved when I tried it, it would have gotten moved. Jason, The pivot point is right there below the floor so no need for too much movement. I don't think anyone has mentioned it in this thread yet but with an aux trans. it becomes important to add auxiliary brakes just in case the trans was to get stuck in neutral. That is a great idea and well done! As you all say, "That's Brilliant Mate", That is the ticket. Adrian,For a long time there was a fellow buying every one of those AA dual high transmissions he could find at the swapmeets or private piles around here to turn around and put into Model A driveshafts. I guess it must have worked but never knew anyone that had one in their A. I have an early Franklin aluminum cased trans that has a rag U-joint in front and a flanged one in back. It's a good,heavy trans. I'm thinking about putting it backwards in another vehicle I have,open driveshaft,with high as direct drive and second as overdrive. Just have to figure out shifting linkage to a cut off shift lever from a lever through the floorboards. The secret is not having to deal with a pilot shaft out the front that will be to the rear. Jason, nice looking project! Adrian,Wow looks great! Jason, if you have the option of shifting the seat back, I would suggest you do it any way. Most cabs are limited in the room you have to just drive the thing. Any extra room would be a bonus. hi bob here I have a 1926 TT . it had a 3 speed warford and a 2 speed warford behind that . I added a two speed ruckstel rear end. looks great inside with 3 shifters. my truck has frame extentions and a weaver tow truck boom. I'd love know exactly how fast it goes in low/under/under/under. Can you even see it move? My truck is super slow with everything in low. I have another transmittion that bolts on the front of the differential. I keep thinking I should put that in it to just for fun. So many neat things for model Ts and TTs. Bob Pilkie is now racing snails just for fun! LOL and they say we are slow in the south.